Heads up fellow coffee lovers! 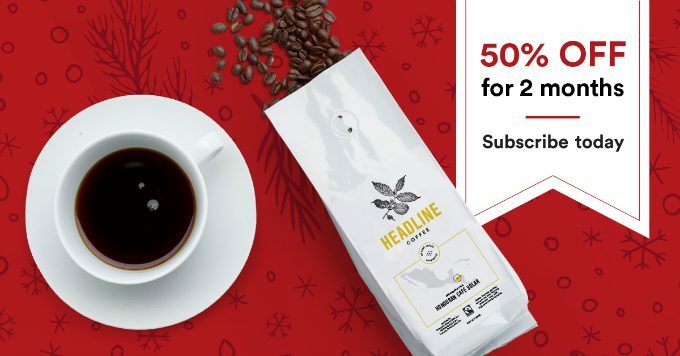 I have an awesome Cyber Monday deal to share with you today from Headline Coffee, a Canadian coffee subscription service that delivers Fairtrade certified coffee to your door every month. Get 50% off your first two months of your coffee subscription with the code SIMPLY50. Buy one for yourself or give as a gift! I’ve said it before, subscription boxes make excellent holiday gifts. It’s the gift that keeps on giving months after the holidays are over. Visit Headline Coffee to take advantage of this special offer! thanks for sharing,that’s a great deal ! Good deal to try this out! Thanks for the information.